Why Should Coffee Beans Be Roasted? How to Roast Coffee Beans at Home? Let’s face it: you’re a coffee snob who craves for coffee perfection. And you’re not alone. Despite the popularity of coffee shops, 79% of coffee lovers say that they still brew coffee at home. With your love for coffee, it’s you who can brew a perfect cup of coffee. But have you ever thought about roasting coffee beans at home? When you roast your own coffee, you can get fresh coffee, roasted exactly to your taste. 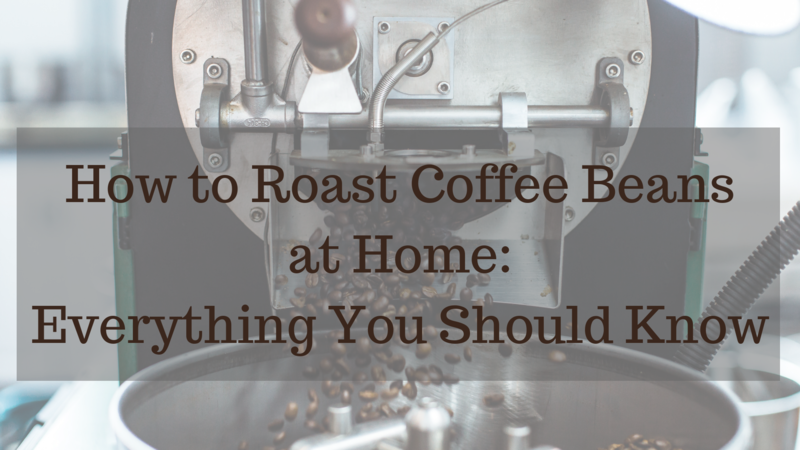 So wouldn’t it be great if you could enjoy the fresh roast flavor right at home? Once you know how to roast coffee beans at home, you can prevent unwanted bitterness or off-flavors from your cup of coffee. Read this article to understand everything about roasting coffee beans at home. At first blush, roasting coffee can be complicated. However, with a little bit of knowledge and practice, the result can wow you: a tasty and pleasant cup of delicious coffee. To begin with, it’s important to understand what roasting is. Roasting is a heat process that turns green coffee beans into dark brown beans we all know. When the coffee beans are brought to high temperatures, the chemical changes begin. As a result, roasting brings out the aroma and flavor that green beans don’t have. Although most people recognize roasted brown coffee beans we use to brew coffee, just a few of us know how the coffee plant and its seed (also known as coffee cherry) look like. The coffee bean is the pit inside the red fruit. To make a perfect cup of coffee, this small red fruit goes through a number of stages: from harvesting to roasting. Before roasting, coffee cherries are separated or “processed” to become those green coffee beans that are shipped around the world. So, why should coffee beans be roasted? it brings out the original flavor: In fact, roasting coffee beans is one of the most important processes as 80% of the coffee flavor comes from it. To keep the fresh roast flavor, it’s important to use roasted beans fast. it takes out or masks the undesired flavor and taste of the beans: before roasting, coffee beans can have undesired organic flavors (stem, corn, grass, peanut shell, capsaicin, wheat etc.). When coffee beans reach higher temperatures, they reduce the undesirable flavors and increase solubility. All in all, coffee should be roasted to reach its unique flavor and aroma. If you want to reach an ideal coffee taste that suits your preferences, it’s important to find the perfect degree of roasting, and there’s no better way than experimenting at home. As a coffee snob, you must know that coffee varies in color, flavor, taste, and aroma. 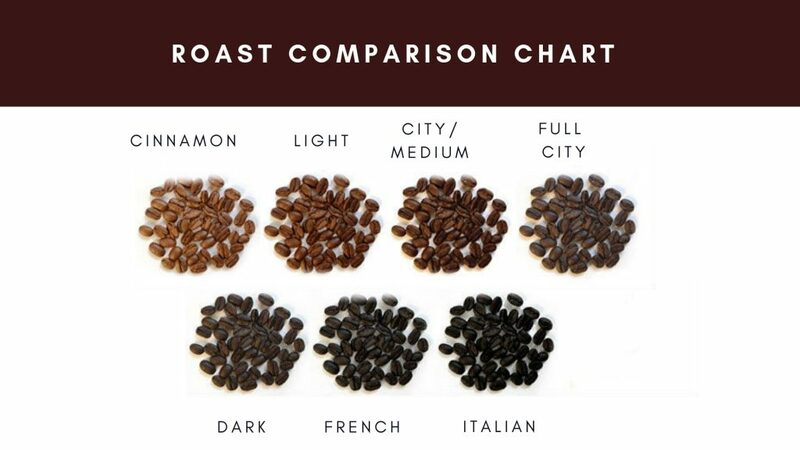 There are different types of coffee roasts from light to dark. These types depend on the type of coffee (Arabica or Robusta), the way of roasting, and the length of time for roasting. Plus, it’s important to pay attention to the charge temperature (it can vary from 375ºF/191ºC to 425ºF/218ºC) and the internal temperature of beans at roasting peak (from 400ºF/205ºC to 475ºF/246ºC). Cinnamon: sharp, acidic, sour tones. Light: acidic but less of a bready taste. City/medium: bright and acidic, traditional roast for the most of the U.S.
Full city: a sweeter taste and a more developed body. Dark: muted acidity, a bit caramelly flavor. French: bittersweet with burnt tones, almost without acidity. Italian: charred flavors are dominant without acidity at all. The lighter the coffee roast is, the more acidic it is. And the darker the coffee roast is, the bitter your tastes. If you want to find a perfect coffee roast level for you, it’s important to understand how to roast coffee at home. Roasting coffee at home is not rocket science. It’s an art that can bring you both joy and tasty coffee. However, before roasting coffee, you need to make sure you have a few supplies. green coffee: while it’s easy to find roasted coffee beans, it can be difficult to find a source of green coffee. Thus, you need to find a place where to buy green coffee first. Bonus tip: once you’ve found a reliable green coffee bean vendor, you can order online to save time and money. coffee roaster: when searching for a perfect coffee roaster, you need to ensure it’s good for home usage, yet it offers all the features you need. Bonus tip: if you don’t want to spend money on buying a coffee roaster, you can use either a frying pan or a bread machine and heat gun. storage for coffee: there are different coffee container types on the market, and it’s not a problem to find the one that suits your needs and wants. Bonus tip: no matter where you want to store coffee at home, you need to remember that it’s sensitive to oxygen, water, heat, and sunlight. 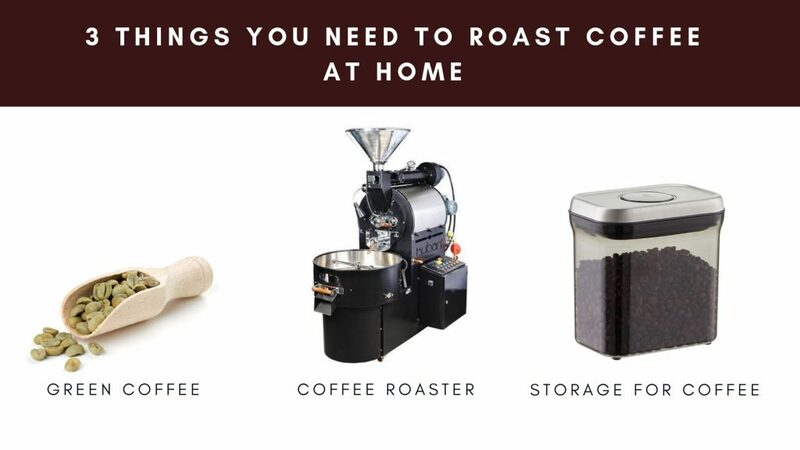 If you’re interested in roasting coffee at home, save the following image to remember three important things you need to start the process. Once you have all the important things, it’s time to understand the process. Roasting has three main stages: the drying stage, the browning stage, and the roasting stage. Preheat the roaster: this stage depends on the roaster you use, so you need to pay attention to the manual. On average, the temperature should be at least 375ºF/191ºC. Add coffee beans: start with adding a small number of beans. If it’s your first time, you need to understand the process practice, not just the theory. Roast: it’s important to keep an eye on the process (the temperature and the color of beans) while roasting. Once you’re satisfied with the coffee roast level, turn the roaster off. Cool: once your coffee beans are dark enough, it’s time to take them out and cool them for a few hours. Store: find an airtight container and put the beans into it. If you want to drink fresh coffee, brew it within 5 days. NB: Roasted coffee beans weigh less because the moisture has been roasted out. Roasting gives 15-20% shrinkage, depending on the type of coffee roasts. As you can see, roasting is not so difficult. And the most pleasant part is to evaluate the results by drinking your coffee. Then, you can learn what is good and bad to find your perfect coffee roast level. Want to know the best part? If you’re ready to roast your own coffee at home, here’s the list of tips that will help you get coffee perfection. Find a place with proper ventilation. Coffee has natural sugars that are converted into CO2 gas during the roasting. Thus, it’s important to have adequate ventilation. If you can roast coffee at a backyard, barn or porch, that’s great. If you choose to roast coffee indoors, you’d better use vent pipe or vent hood. Use good green coffee beans. The quality of coffee in your cup depends on two main things: the quality of coffee beans and water. If you want to roast high-quality coffee, invest in buying good green coffee beans even though the price may be high. Stay alert. It takes just a few minutes to turn roasted beans into burnt ones. Thus, it’s important to keep an eye on the process at every stage. Multitasking while roasting is impossible until you have enough practice to control the process. Although roasting coffee requires knowledge and skills, you can learn this art with a little practice and drink freshly-roasted coffee at home. To find your perfect roast level, you need to experiment with new things. For now, you know how to roast coffee beans at home. And if you want to master these skills, you can read additional information. So, start now to enjoy your delicious coffee tomorrow. Craving for unique coffee taste, are you ready to roast coffee at home?